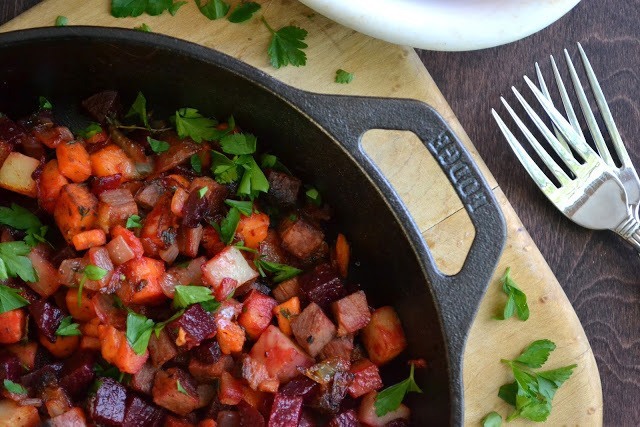 Put the beets in one saucepan and the sweet potatoes and red potatoes in another. Cover with cold water and cook until the vegetables are tender. The beets will take slightly longer than the potatoes. Drain and set aside. Melt 2 tablespoons of the butter in a skillet and saute the onion for a few minutes until it is translucent. Add in the last 2 tablespoons of butter, the beef, and vegetables. Sprinkle with fresh thyme leaves and let cook until browned on the bottom. Flip the hash and let brown on the other side. Season with salt and pepper to taste, and serve hot, garnished with chopped parsley. You can also top with a fried or poached egg.